“Let’s Get Together”, Shimizu’s second solo release, is a celebration of the song-book of a life-time and a musical journey that pays homage to jazz standards and selections from the great American pop and rock song-books. Produced by veteran Clarke Rigsby (Joey DeFrancesco, Jimmy Smith, Tower Of Power) the album features Shimizu’s Arizona-based quartet including Mario Mendivil (elec. bass), Lamar Gaines (piano, Wurlitzer, Clavinet), Mike Florio (drums) and Todd Chuba (percussion) as well as a vocal cameo by singer-songwriter Obadiah Parker (Grandma’s Hands), who lends grit and soul to the session. Shimizu’s trek into the non-traditional also includes a foray into the traditional organ-trio setting featuring New Yorkers Pat Bianchi on Hammond B3, and Carmen Intorre on drums (both on-loan from the Pat Martino Trio). “Let’s Get Together” presents Shimizu’s unusual take on “standards”. Rather than mine the older American Song Book, he selected songs that he grew up with in the ‘60s. There’s plenty of swinging, melody and improvisation to go along with a wide palate of rhythmic styles and sonic beauty and warmth, but make no mistake about it, this is a jazz recording - harmonically, sonically and rhythmically. Shimizu’s solo’s in the organ trio settings are a stark contrast to the fiery organist Bianchi and the simmering Intorre. In other moments, the quartet grooves hard and allows Shimizu the time and space to deliver his message. 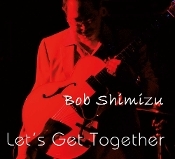 With “Let’s Get Together,” Bob Shimizu cements himself as a purveyor of melody and space. Shimizu’s intention is to deliver engaging tracks that the listener can fall into comfortably, like a conversation with an old friend. Copyright © 2011-2019 Signal Strength LLC. All rights reserved.